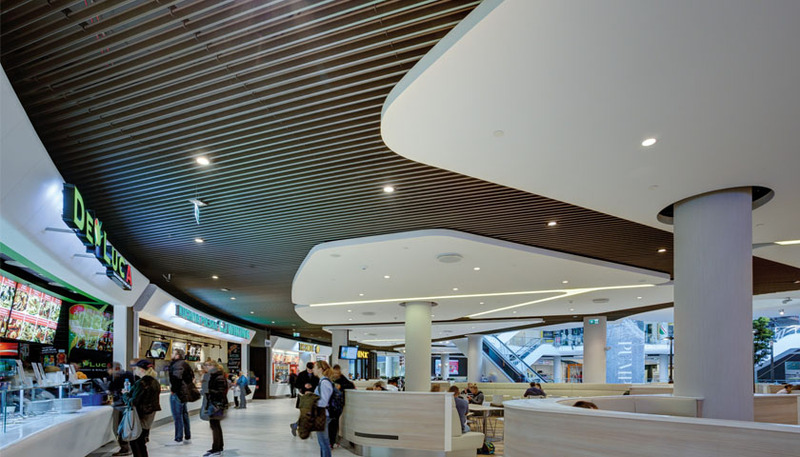 The Hunter Douglas range of Luxalon aluminium ceilings has added an interesting dimension to the concourse areas of The Blue City shopping complex in Warsaw Poland. Split over four floors this huge shopping complex is famed for its wide uncluttered walkways and abundance of light. The feeling of space has been further enhanced with the specification of Hunter Douglas’s Luxalon V100 metal baffle ceiling system to the ceiling of each of the floors concourse and walkways. Luxalon V100 and V200 screen ceilings are ideal for such environments. They consist of vertically hung panels that can be positioned to create visual and directional lines a common requirement for large retail locations such as shopping centres and malls. Panels are available in 100, 150 and 200mm modules and can be simply clipped to the carrier system. Where regular access to the plenum is required a sliding carrier system can be installed to allow individual panels to be slid to one side for easy access to the plenum. Hunter Douglas’s range of Baffle Ceilings are available in a wide range of lengths and widths. They can be used in straight lines, in varying depths, non-parallel to create different configurations and as screens. They are supplied in a range of standard and custom made colours and finishes including Hunter Douglas’s new range of wood effect veneers. For more information on the baffle ceiling range please visit the Hunter Douglas Website.